A Question for Professional Tarot Readers: Do You Talk About the Cards? Key III: The Empress. From the Hermetic Tarot. I’ve been observing dozens of professional tarot readers conduct their readings. The observations prompted me to think about the practice of describing the tarot cards to the querent (or seeker). For example, if a seeker asks whether she will find love in the coming year and you the tarot reader draw Key III: The Empress, which of the below better reflects your response? Method A takes longer because you are identifying and describing the card first before interpreting it for the seeker. It also got me wondering: how many seekers really care about the cards? Are they requesting a reading to learn the names of the tarot cards? Does knowing that you pulled a Seven of Swords or Nine of Pentacles really mean anything to them? Or do they just want the answers to their questions? 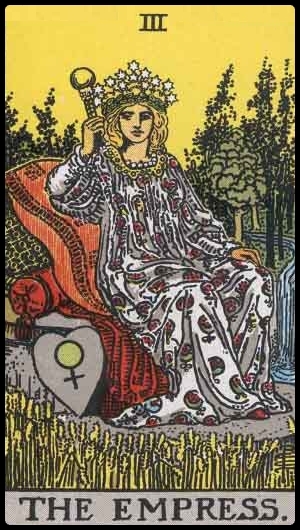 If, however, you subscribe to the notion that the signs and symbols of the cards are the language of the unconscious and as a tarot reader, you are just an interpreter, then by providing the signs and symbols to the seeker, that person might be able to get more from the meaning than you were able to see. So why wouldn’t you provide the signs and symbols on the chance they might see something you didn’t? Any bilingual person understands this concept on an intimate level. As for Method B, it is more direct. It answers the seeker’s question right away, which I have to assume is what most seekers want from you–a straight answer. I wonder if they really care about the elemental dignities of The Empress, the planetary influence, or what the empress depicted on the card is wearing. Key III: The Empress. From the Visconti Tarots by Lo Scarabeo. Per my observations, and do keep in mind the sample size I am working with to base these conclusions on are really laughable, it seems that those who approach tarot from a psychic-medium-intuitive angle are going to talk directly about the meaning of the cards as they interpret them for the seeker and may only gloss over the name of the cards. They focus on the clairvoyant aspect. Those who approach tarot from a more psychoanalytical perspective are going to be, well, more analytical. The card name will be given, with signs and symbols explained. They might prefer the seeker to be actively engaged in the reading process, and so even though the reader will offer his or her interpretation of the cards, the seeker is also encouraged to look at those signs and symbols and find personal meaning. Here’s how I see it. Hubby and I were someplace together once and I noticed a hawk perched on top of a fence, seeming ever out of place, with a gaze fixed steadily at us. Hubby and I both made eye contact with the hawk and I swear a shared moment passed between the three of us. Then the hawk flew away. The Hubby saying to me, “Over there is a hawk. I bet you it is an omen. This is what I think the omen means.” is entirely different from me seeing the hawk personally and being a direct part of that shared experience. Sure, Hubby can then ruminate about what he thinks the omen means with me, but that direct, personal connection I had is equally if not more significant. Thus, as a tarot reader, I always share my cards with the seekers. For me it depends, sometimes Clients like the fact that you point out things in the cards that have lead you to your interpretation. But I think it is all in your delivery. I have seen readings where the person literally states what the meaning of the cards are and nothing else and that I feel leaves some of the magic of weaving the cards into the persons life for them. I do include some of the card symbols and meanings to my Clients but I also allow my intuition to tell me when and what. Great question! Wow, just stating the textbook meaning of the cards and nothing else? Why go to a tarot reader then? 🙂 But no, I totally get what you mean. Thanks for sharing, Ethony! I think it depends on the personality of the client but, for most people, I think A is way too much and B is not enough. “A” reminds me of people that ramble on and on, discussing every little detail of their story, and annoying everyone in the room because they won’t get to the point. They lose your interest. It’s information overload and filled with too much minutiae, like it’s a tarot lesson instead of a tarot reading. That being said, clients do need enough information to form an overall picture and get a general idea of what’s driving the interpretation of the cards. You want to give enough information, but not too much information. It’s like when I had my brakes changed. The mechanic told me about the brake pads and rotors and gave me a general idea of what he would do and how long it would take. If he had told me about the location of every screw and nut, the origins of the parts, the detailed functioning of the brake system itself, where the parts were manufactured, etc, my eyes would have glazed over, I wouldn’t have remembered anything he said, and I would have wondered if he was trying to impress me with how smart he was so he could charge me extra. I say stick with a “just enough to be full but not stuffed or hungry” medium. Definitely somewhere between A and B would be best! “Just enough to be full but not stuffed or hungry medium” is the way to go, for sure, but isn’t that the rub? How to know when you’re full but not stuffed or hungry? I know I always think I’m hungrier than I actually am. 🙂 I stop eating when I think I’m “full” only to realize 3 minutes later, oh no, I’m stuffed beyond capacity. Guess that’s where intuition kicks in when you’re reading tarot! Great question. 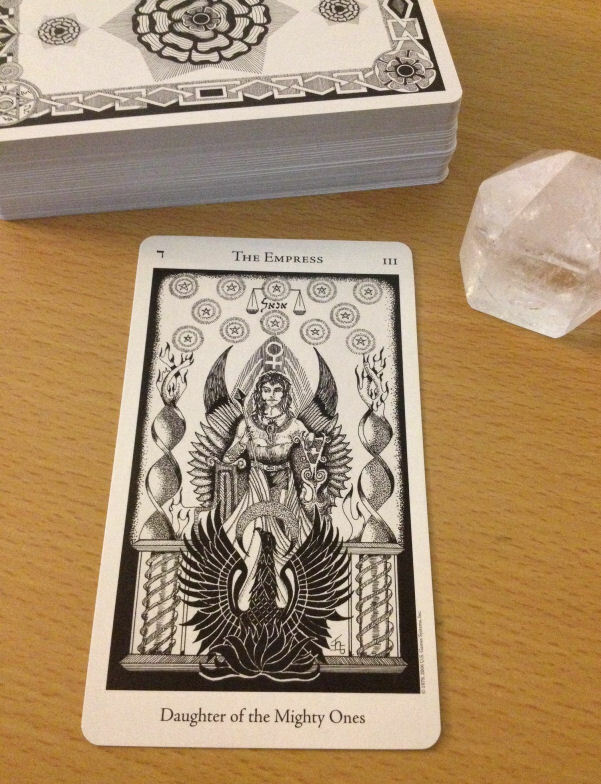 I tend to talk about the Tarot card in my email Tarot readings because I want to share with the client what i see. I actually encourage my clients to look at the card’s imagery and see what comes up for them, with a few prompting/thought-provoking questions to assist. 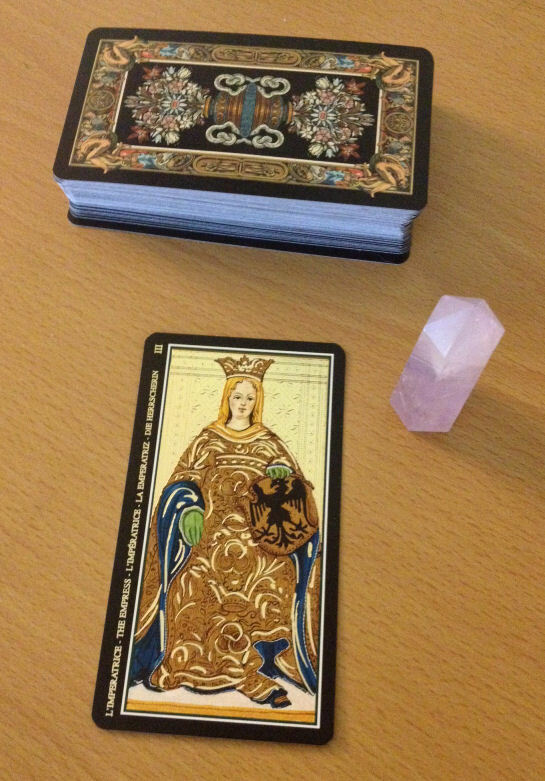 I see a Tarot reading as a co-creative process, not simply me telling the client what will happen. They are an important part of their own destiny, and so I feel they should be a part of the reading. I would tend to agree with you! As a querent, I like to know a bit about my tarot reader’s reasoning, so as a tarot reader, I try to offer some insight into my reasoning, why I conclude what I have about the querent’s situation. What a thought provoking post, Benebell! I definitely struggle with the desire to tell the querent why I’m interpreting the cards for them in a certain way, and that can launch into a barely comprehensible tangent on astrology, numerology, elemental dignitaries, blah blah blah, that isn’t often very helpful. Especially in an email reading, these explanations can get wordy and time consuming, and rarely add anything super important to the reading. I guess, I just don’t want the querent to think I’m making things up out of the air, which reflects a personal quest to make tarot accessible and understandable to everyone, instead of a total mystery. I want the querent to have the same power to shape their destiny as they think I have.